Carriage Roller - Especially designed bearings referred to as carriage rollers are often seen on lift masts as they allow them to function better in challenging environmental surroundings. The typical lift mast is usually subject to frequent shocks, oscillations, high dynamics and static loads and vibrations. This equipment is regularly exposed to environmental influences like for example heat, dust, cold, moisture, contamination and aggressive ambient air. Hence, the lift masts' guidance arrangements should be particularly tough and have a certain high load carrying capability. 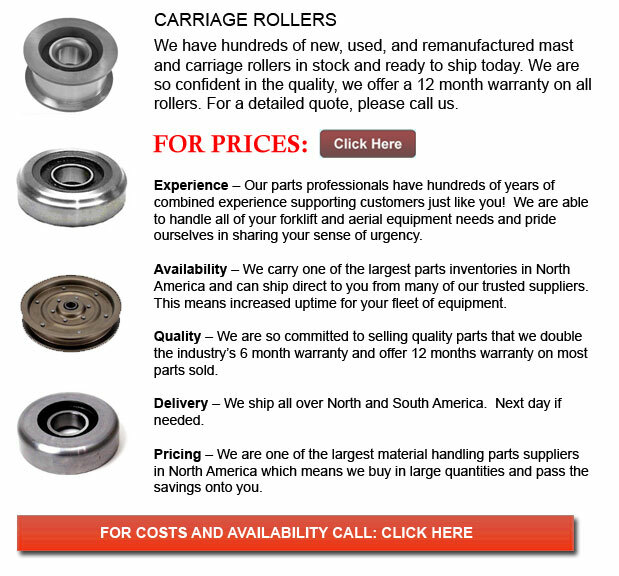 Carriage rollers have been developed as the answer for operating in various environmental surroundings. These bearings are the answer where the guidance arrangements of the lift masts should be cost-effective and maintain operational security while having the ability to handle a specifically high load carrying capacity.